Ki (pronounced as key), is the Japanese word for our Energy. It has also been called Chi (Chinese), Prana (Vedantic), Lung (Tibetan), Mana (Hawaiian), Vital Energy (Western), the Force (Star Wars) and so on. Just about every ancient culture in the world and many modern cultures have the concept. Ki is the binding agent that joins martial arts, healing arts, meditation, connection with nature and many other of mankind's cultures and arts. A Buddhist approach is to think about choice. If for example, you have just been made redundant then you probably feel angry, disappointed and frightened to name just a few of the emotions. We cannot choose our emotions but we can have choice about the effect of our emotions. If you are feeling frightened and angry after being made redundant then it is easy to imagine getting into arguments or other negative actions. This is a choice that YOU have made. Awareness of the fact that you have made a choice empowers you to do something about it. First, you need to acknowledge the fact that you feel angry, frightened or whatever it is that you are feeling. Now you can make the choice. You can say OK, I feel angry but taking it out on others will not make me feel less angry. Why not get a bit of fresh air to calm down a bit and then think about what I actually want to do with my life? This mindful approach is excellent when you are trying to get through a difficult time. Sometimes though, we get caught up in a spiral of sadness, anger or any other negative emotion. A useful technique to break that cycle is called the “the inner smile”. Think for a moment about when you meet somebody. If they smile at you then it is difficult to not smile back at them. 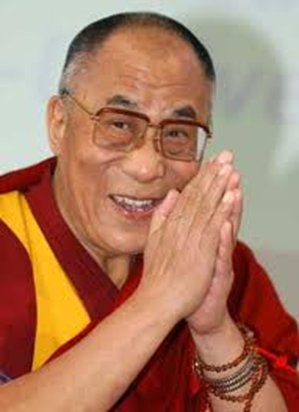 Look at the picture of the Dali Lama. His happy smile will probably cause a flicker of happiness in your own heart. Try the following meditation to lift your spirits. 1. Sit down somewhere quiet and close your eyes and relax. 3. Smile! This alone actually reduces tension. 6. Imagine that your heart is smiling back at you. The mindful approach and the inner smile will not make your difficulties go away. What they can do is reduce the negative impact of life’s difficulties and help you to become at peace with the changes in your life.